Microsoft Open Database Connectivity (ODBC) is an application programming interface (API) designed to access data from a different of database management systems (DBMS). ODBC is designed for relational data stores. In this article, we will explain how to install the appropriate ODBC drivers for SQL Server, how to configure ODBC to connect to a SQL Server instance and how to create and configure a Linked Server using the ODBC driver and the MSDASQL provider to query tables on a SQL Server instance. The diagram below explains the flow of connecting to a SQL Server database using the MSDASQL provider and a SQL Server ODBC driver. MSDASQL allows OLE DB consumer applications to use ODBC drivers to connect to a data source. The provider transforms incoming OLE DB calls into ODBC calls, and transfers them on to the specified ODBC driver. After that, it retrieves results from the ODBC driver and formats those into OLE DB specific structures which the consumer has access to them. The ODBC Data Source Administrator dialog box is used to create and manage ODBC data sources. The ODBC Data Source Administrator dialog box is a Windows component. As you may notice, there are two versions of the ODBC Data Sources Administrator dialog boxes: one is the ODBC Data Sources Administrator (32-bit) and another is the ODBC Data Sources Administrator (64-bit) version. Since Windows 8 is the operating system, there are two the ODBC Data Sources Administrator dialog boxes, one is for 32-bit ODBC Data Sources and the other is for 64-bit ODBC Data Sources. Cannot initialize the data source object of OLE DB provider “MSDASQL” for linked server “SERVERX86”. To create a new SQL Server ODBC data source, press the Add button under the User DSN or System DSN tab. Both of these tabs are used to create a connection to ODBC data source, the difference is that the User DSN tab will show data source only for a currently logged user on this computer. While creating data sources under the System DSN, it will be available to any user that is logged on to this computer. After setting the appropriate Server and connection name, press the Next button. In this dialog, how to connect to SQL Server by using Windows authentication can be specified, including Active Directory authentication or using SQL Server authentication. On this dialog, set the database that you want to connect to, by checking the Change the default database to check the box and from the combo box, choose a deserted database. This means that communication link between the driver and the data source to which the driver was attempting to connect failed. To resolve this, close the ODBC Data Sources Administrator dialog box and try again to create connection to ODBC data source. Don’t forget to restart SQL Server under the SQL Server Services after enabling Named Pipes in order to changes have effect. Now, when the ODBC data source is created, let’s create and configure a Linked Server using the ODBC. 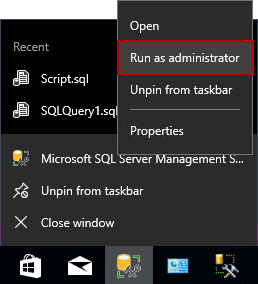 For more about the Security and Options tab, see the How to create and configure a linked server in SQL Server Management Studio page. @rmtpassword is the password of the remote user used to connect to a remote server, for security reasons password is changed with ‘########’. More about how to create and configure a SQL Server linked server using T-SQL can be found on the How to create, configure and drop a SQL Server linked server using Transact-SQL page.